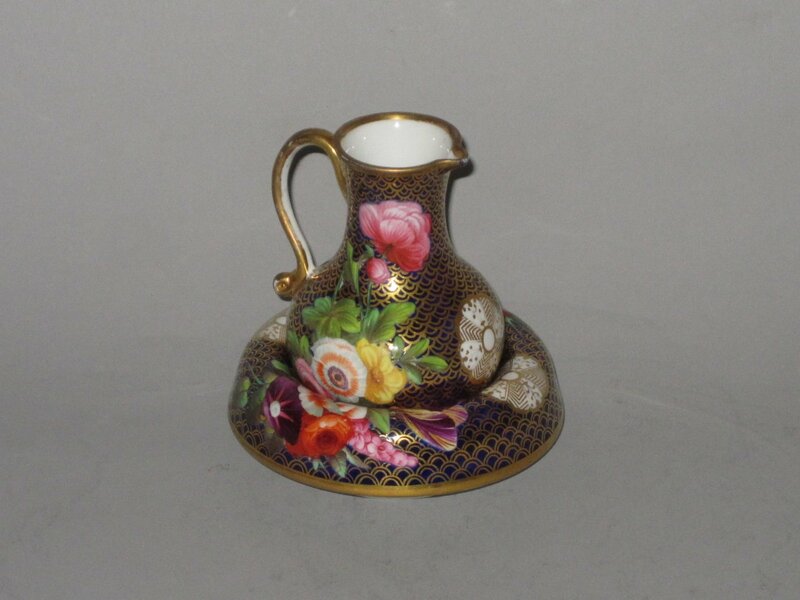 SPODE PORCELAIN JUG AND STAND. A SMALL SPODE PORCELAIN JUG AND STAND CIRCA 1815. DECORATED IN PATTERN 1166. Referred to in the Spode design cataloge as "Bottle Milk with Turned Down Stand"
Reference: Spode, Leonard Whiter, colour plate V, fronticepiece facing page 54. Spode pattern number 1166 was introduced circa 1806 and was one of the most sumptuous designs produced by Spode. Painted by hand with all over sprays of brightly coloured flowers and gilded mons, reserved upon acobalt blue ground with graduated gilded scales.